...like my turkey! Are you? I hope you all had a very nice Thanksgiving Day. I know I did. My DH and I hosted dinner at our house for his mom and dad and my mom. I made the dinner, my mom made the sweet and sour cabbage ("kapusta" in Polish) that we all love, and my MIL made the pies...pumpkin, lemon meringue and chocolate. Hence, I'm stuffed! 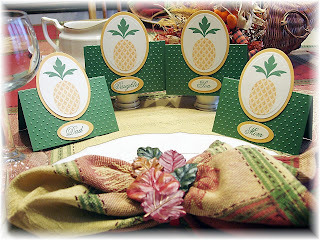 I decided to make place cards this year because I was inspired by Nichole Heady's blog entry about table settings using her First Fruits set. I guess I was most inspired by Debbie Olson's setting and made these place cards. 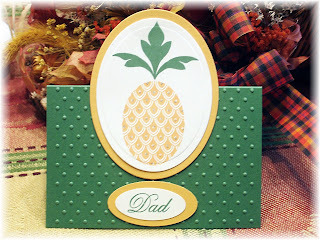 I stamped the pineapple in Appricot Appeal and Garden Green on vanilla cardstock. That green is so rich! I just got this pad a few weeks ago and don't understand why I never got it sooner! I cut and embossed it using the oval nestabilities then backed it with a piece of Appricot Appeal using a larger oval. The Garden Green base (4.25" x 5.5") was run through the swiss dots cuttlebug folder and folded in half. I used a glitter pen on the dots of the pineapple and it shined in the light. I used Women of Life and Men of Life (which I just got on Wednesday, in time to do these!) for the "names". I decided to go generic for my DH and I, using "son" and "daughter". (I had a "husband" stamp, but not "wife"!) I made two "mom" placecards, but only took a picture of one of them. Everyone thought they were pretty and took them home. I gave the son and daughter ones to my MIL to use when she has us over for dinner sometime (soon I hope!). Have a great weekend and "Happy Shopping" to all of you crazy shoppers out there! Oh, and remember...blog candy as soon as I reach 10,000 hits!! I made a few cards this weekend for Thanksgiving. This one I shamelessly cased from Debbie Olson. I went to the PTI store and clicked on the gallery for this First Fruits set to get some ideas and saw this card by Debbie and just couldn't think of way to change it to make it different, so I just cased! I did add the artichoke piece behind the dp and made the card a 5.25" square, omitted the jewels and changed the ribbon, so I guess it is a little different! I made two of these...one for my mom and the other for my in-laws. I used pumpkin pie on the tips of the wheat by just touching the tip of the pad to the tips of the wheat. Then I took a chocolate chip marker and colored in the stems right on the stamp and stamped it on Naturals Ivory cardstock. It was then cut and embossed with the largest oval nestability. Before I took it out of the die, I sponged in some More Mustard, concentrating most of the color in the center and worked my way out. The dp is also PTI's First Fruits and the ribbon is unknown. It's red on the reverse side. The image in on dimensionals. For the inside, I took a strip of the background dp and cut along the scallops. 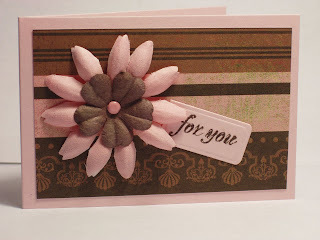 Again I used artichoke and naturals ivory cardstock. I used various stamps for the sentiment. After the card was completed, I added orange stickles to the tips of the wheat to sparkle it up a bit. I set it aside far away from me to dry...how many of you know the reason for that? I can't tell you how many times I've messed up my stickles! 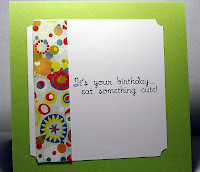 Since I had the Naturals Ivory cardstock out, I thought I'd use it on this card. It was ok, but I wasn't that pleased with the outcome. I stamped this SU Season of Friendship stamp in chocolate chip for the tree and then used sage shadow, really rust, and creamy caramel for the leaves. 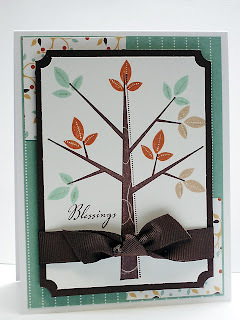 The dp is Autumn Vine and the other cardstock is sage shadow and chocolate chip. 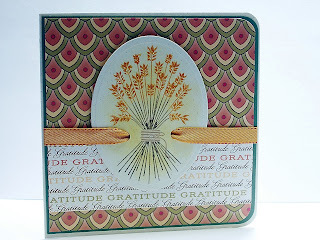 The sentiment is from So Grateful from GinaK Designs. The big brad is a build-a-brad from SU using the same dp. I used a glitter pen on the tree and leaves, which doesn't show up on the picture. When it hits the light, it shimmers nicely! Well, since I wasn't really happy with this card, I had to something to make it better because I had about five more to make! So this next card is one I came up with that I like much better. I wanted to used the same stamp set, but changed to PTI white instead. It just popped off the page much better. I also used a sketch from Our Creative Corner. 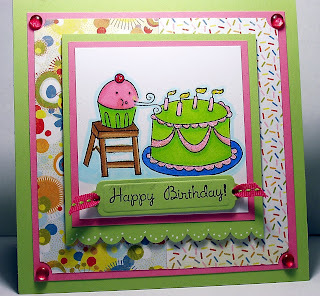 As I was linking this site, I noticed that Dawn Easton made a card very similar to mine (I swear I did not see hers...I found this sketch on Cindy Haffner's blog!). Anyway, I used the OCC sketch along with the Autumn Vine dp again and PTI white as the base. I like this so much better. 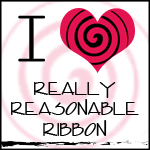 The ribbon is SU's chocolate chip grosgrain and the sentiment is from PTI's Out on a Limb. I also used the glitter pen on the tree and leaves. This was very easy to do and quick. I made five of these within a reasonable amount of time (for me, at least!). Here's the inside. I really like the way the leaf border looks. 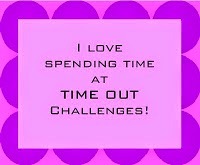 The sentiment is from My Sentiments Exactly that I got at my LSS, Buffalo Stamps & Stuff, a while ago. Well, thanks for letting me blah, blah, blah! I haven't posted in so long and I've been feeling guilty watching my counter grow each day. I'm getting close to 10,000 hits, so watch for some blog candy! 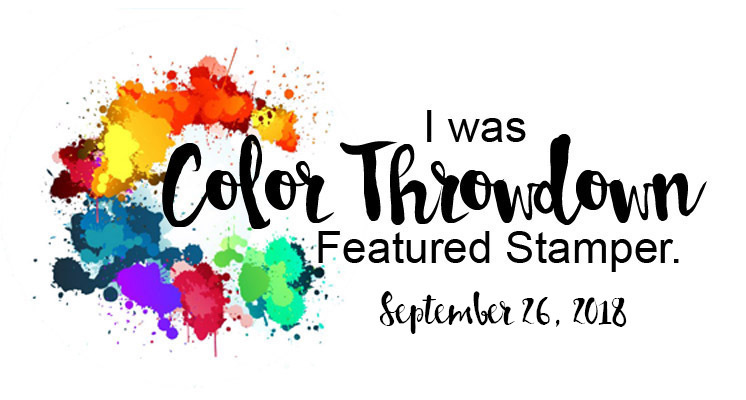 I found some things I purchased twice (without knowing) and some other fun stuff, so please keep stopping by! Happy Thanksgiving to all my U.S. friends and have a great week to everyone else! I received sad news last week that the mother of a childhood friend passed away. The family still lives down the street from my mom, but I rarely got to see them over the last 15 years or so (you know what happens when you are busy making a living...you forget to make a life!). Aunt Norma, as we all called her, was a wonderful woman. She always loved having all the neighborhood kids in her pool and playing kickball in her yard in the summer or in her basement playing the multitude of games she bought for her son and daughter, Matty and Nancy. We will miss all these people as they leave us as they remind us of our childhood frivolities and the ease of being a child. So different today! Anyway, here's the card I'm sending to the family. 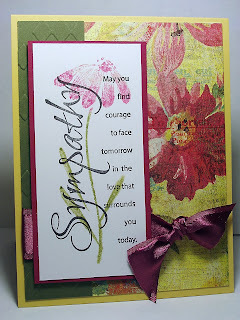 I actually got my inspiration from this card done by Frances, or Stamp Owl on SCS. I bought the stamp and put the card in my favorites to use as inspiration someday. I colored the Penny Black flower with watercolor crayons, sprayed it with water (well actually it was my stamp cleaner...I thought I had the water bottle! ), and stamped on the cardstock. The sympathy sentiment was stamped over it. I love this stamp...such a pretty font and beautiful sentiment. The dp is Basic Grey's Stella Ruby. I paired it with So Saffron and a cuttlebugged piece of Always Artichoke. I used some of the retired Purely Pomegranate satin ribbon that I am hoarding! A simple card, but elegant I think. The colors are much softer IRL. Well, that's all for today. I'm getting ready for my class on Friday. We are doing Christmas cards and I have some real pretty ones to share later. I cased some, but changed them up a bit. I hate designing cards when I'm under pressure, so I get a little help from my friends (are you singing that Beatles song now?). Have a great day and thanks for stopping by! Isn't this little guy so pathetic-looking? 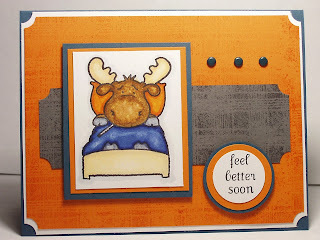 I just love these Riley moose stamps from Hanna Stamps! I just purchased about six of them unmounted because they are so much more reasonably priced. I simply mounted them on some EZ mount cling vinyl that I got at GinaK Designs. I only purchased one sheet, but I've mounted several stamps and still have some left over. I have to put that on my list of things to get. Once the stamps are mounted on the cling vinyl, you simply adhere them to your clear block and stamp away! You get a very nice impression. I needed a get well card for my friend's DH who had a partial knee replacement last week. He's doing well, and I thought this little Riley moose was "manly" enough to send to him. I had a dickens of a time making this because all I wanted to do was add something scalloped or add a pretty bow and ribbon! This is what I ended up with...some brads! I used Not Quite Navy, Pumpkin Pie and Basic Gray. 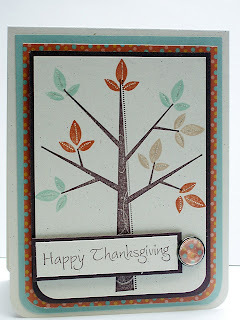 The pumpkin and gray were stamped with Flannel bg stamp (that's a "manly" stamp in my book!) with pumpkin pie and basic gray inks. The sick little Riley was colored with copic markers. I decided to add the white after I had already adhered the pumpkin to the base, so there's not a lot showing, but it just popped the pumpkin off the navy so much better. I wish I had thought of it earlier! The sentiment is from an Inkadinkadoo clear set...I don't remember which one. I hope he gets a chuckle out of this one. I wrote on the inside "I hope you are up and chasing Maria around soon!" He'll like that! Thanks for stopping by and Happy Veteran's Day! Wow, what a day this has been! My niece Maria will be 14 years old on Wednesday, and her party was today. I always make her cakes and I was excited about this year's cake. I decided to go with a cupcake theme. 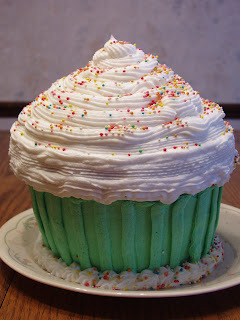 I had my eye on a new cupcake pan from Wilton which makes a giant cupcake! Really cute! Here's the cake. This cake actually served about 11 people! Maria likes green so that's the color I frosted the bottom half. The pan actually makes the bottom fluted, so you could leave it unfrosted, but what's cake with only half of it frosted? I also made chocolate cupcakes because I didn't think this cake was going to serve so many! I bought these cute cupcake liners, but you couldn't see the design on them because of the chocolate cake! 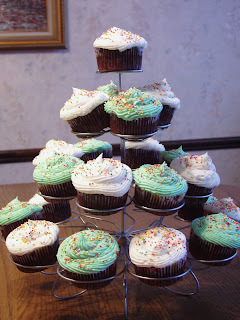 Here's a picture of them...I borrowed the cupcake stand from my friend, Tracy. It looked really festive! I even got Maria a new Pandora cupcake charm for her bracelet! I was very happy to see that one at the jewelry store! Now with all this cupcake stuff going on, I had to make her a cupcake card! I used Sweet Celebrations from Taylored Expressions. I also used Taylor's cupcake challenge #41 for this week. It was the perfect sketch for this card. The dp is Basic Grey's Cupcake (did I go overboard with the cupcakes or what?) and I also used Certainly Celery, Regal Rose and PTI white. The image was stamped in Adirondack Pitch Black and colored with copic markers. To get the scallop on the bottom of the celery piece, I used SU's scallop border punch. I used a white gel pen to accent the scallops. The sentiment was cut out using the tag nestabilities and I simply ran a ribbon behind it and pulled the tails out the holes. The corners of the dp were punched with the ticket corner punch and I placed dew drops in the corners. It's hard to see, but I put glitter on the cherry, the flames of the candles and the accents on the cake. Maria loved the "cupcake" theme and her cupcake charm. I'm glad this day is over. I used to make 3 to 4 cakes on a weekend when I was in that business, but now I don't know how I did it! It's exhausting work and messy! I came home from the party and still had to clean the mess! I can still smell all the frosting! Well, have a great week and thanks for checking in! I went to a 40th birthday party for a girl I work with and made another box in a bag (I just love those things and I'm making another one for a 14 year old tomorrow, so stay tuned!). I saw the inspiration challenge IC153 on SCS this morning and was mulling over this card all day while shopping at our new Hobby Lobby here in Buffalo! I chose this girl's outfit as my inspiration. I pulled the brown, pink, and red from it to use in the card. I started by picking my stamps. 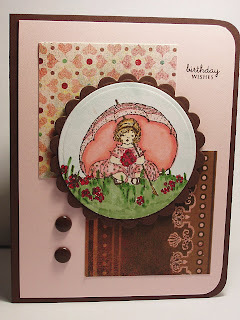 I just love this little girl from Clear Art Stamps called Sweet Kids. I colored her with copic markers (not my best job...I was rushing again!) and used a glitter pen on the dots on the umbrella and her dress and on the middle of the flowers. 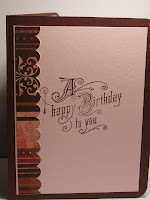 I chose my layout from one of Lauren Meader's sketch challenges and used Basic Grey papers (Blush and Crush, I think). The image and mat were cut with nestabilities and the sentiment is from PTI's Mixed Messages. 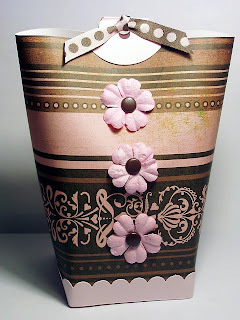 I used the Basic Grey paper again to make the bag and also used Pink Pirouette. Pink prima flowers, brown brads and a reversible brown/pink ribbon tied it together. My gift to Amy was a gift card, which was going in the bag, but I didn't want to just put the card in there. It needed its own little card. I just used the same papers and cut it to fit the gift card and added the flowers and tag. The gift card was held in place with glue dots. I have another to do tomorrow for my niece's 14th birthday. I making her cake (a big cupcake) and got her a gift card and a cupcake charm for her new Pandora bracelet, so this bag will be perfect for it. This ensemble will be a cupcake one for sure! Thanks for stopping by and stop in again tomorrow! I got a sweet surprise today when I opened my mail. This card from Dawn Lusk! 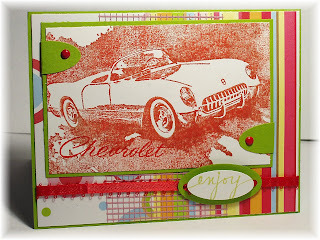 I left a comment on her SCS gallery for this card saying that I wish it was accompanying a Corvette that I've been wanting for my 5oth birthday (in a couple of years, not now!). My DH says "no way", but I'm still holding out. My dear brother had two of them, and when I was a senior in high school, he would let me drive it to school (yes, he was a "cool" brother, nine years older than me). How cool did I feel pulling up next to the other kids' station wagons and broken down cars? Anyway, I just had to post this and thank her so much for this nice Random Act of Kindness! Thanks so much Dawn, you made my day! Hi all! I've just been watching the news and am very pleased to see the lines of people waiting to vote! Kudos to all of you who waited and voted. I don't care who you voted for (I'm not campaigning for anyone...that is your choice to make), I'm just asking for you to exercise this most important right. I don't have a card to share with you, so I'm just posting the most patriotic one I've done in the past (you can see the details in this post). Happy Election Day everyone! Thanks for stopping by! When I saw the Inspiration Challenge on SCS today, I thought, nope not playing today! You see, it was an Asian inspired piece, and I'm not fond of Asian-themed anything...it's just not my style. The inspiration Stephanie chose today was the work of an artist named Don Li-Leger. His signature style is called "Asian Fusion". So you see why I went running! So I left the house to do some errands and meet my friend, Maria, for lunch. We went to a new place, which was really great. When I sat down, guess what was staring me in the face? One of Li-Leger's artwork hanging on the wall! Now what are the chances of that happening? Maria said it was an omen and that I had to play today! So this is what I came up with. I'm not that thrilled with it cause it just ain't my style! But I guess I can live with it! Here is the piece of Li-Leger's artwork I chose. 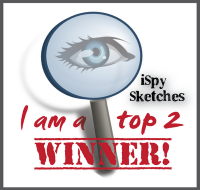 I started by looking for a sketch in my collection I keep and came up with one by Jen del Muro from a few weeks ago. I used SU's Embrace Life for the fern and various papers from Cosmo Cricket and Basic Grey (Stella Ruby) that looked like they had an Asian feel to them and that were similar to the inspiration piece. 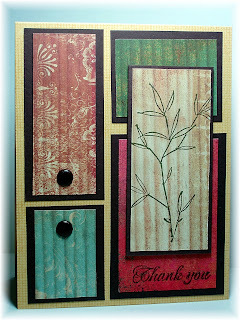 I stamped the fern in Always Artichoke right on the dp that looked like bamboo. I mounted all the pieces on Chocolate Chip and placed brown brads on two of them. They were then mounted on the So Saffron base that was stamped with Canvas bg in So Saffron. The sentiment is from SU's Fresh Cuts. Well, that's my story for today. I had no business stamping today when I have papers to correct and report cards to get started. I have a busy week coming up too! 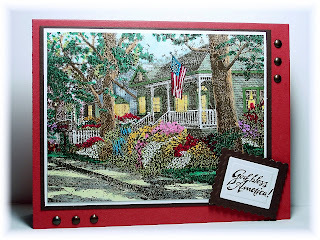 And tomorrow I'm attending a holiday stamp camp at my LSS, Buffalo Stamps & Stuff! I think we are making about 15 different cards! I'll have to post them! Well, that's all folks! Thanks for stopping by!